TLC Distribution cables are designed for general indoor use. Offered in all fiber types, a thick durable jacket offers excellent strength and protection during installations and restorations. 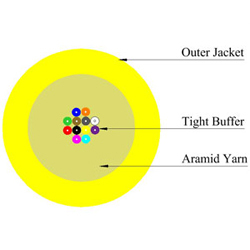 The 900um color coded tight buffers allow for easy identification and termination. Cables are available in OFNR, OFNP and LSZH constructions.